By Craig Bailey	Financial Success, For Fun! To Invest In A Pool, or Not? To be clear, the jury is still out in my mind as to whether a pool is an investment, or not. I guess we’ll find out when it comes time to sell our house. Back in the late ’90’s my wife REALLY pressed me on getting a pool. While it sounded nice, I wasn’t yet fully convinced. We were still having fun with our young tikes running around the yard with super-soakers and playing in the sprinkler. If we have such an attraction in our yard the kids would be more apt to hang out here (under our purview) than someplace else (thus “reducing” the potential trouble they could get into). It would be a lot of fun, right in our own backyard! The water to fill it each year (after the thaw and when evaporation takes more than Mother Nature puts in via rain). We are fortunate to have a well, which provides free water. However, when you need to put in 10,000 or more gallons it is safer to have a water truck come by for the fill-up to avoid draining the well. What do I mean by a science experiment? For pool owners, you know! On one day the pool water may be absolutely crystal clear and beautiful. Turn your back and the water is dull, cloudy and milky green. WHAT HAPPENED THIS TIME ?!?! I thought I was following the prescribed regimen to the “T”. One of the local pool supply companies is managed by what we call a “Pool Nazi.” This guy cuts you NO breaks. We ask what we “think” is a simple question and he hammers on (thinks he is teaching about) the proper care and feeding of a pool to maintain the perfect pH balance, etc. And, regardless of the pool supply store you go to for a water clarity issue, you’d better have room in your vehicle as they are going to LOAD YOU UP with lots of chemicals. Cha-ching! As you might imagine, an above ground pool is more of a temporary structure vs. an in-ground pool. Even so, with good care, it can last for many years. Assuming this, we put in a very nice deck to enhance the backyard experience. Due to the HEAVY snowfall this year our pool liner failed us. We observed this several weeks ago as the winter cover and snow on top slowly descended into the pool, until it was laying on the bottom. This wasn’t a total shocker, since pool liners are typically only warrantied for 10 years and we got 14 out of ours. 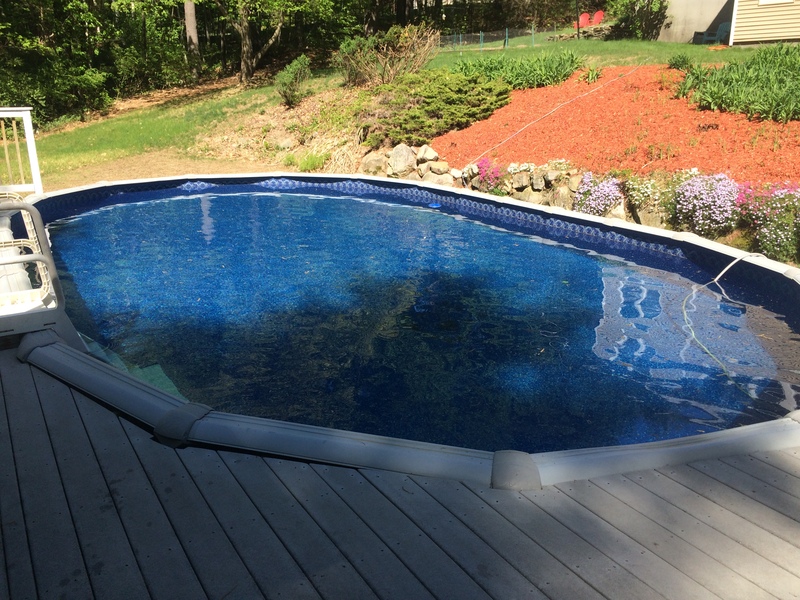 At time of writing, Daigle Servicing Company (NOT the company with the Pool Nazi, mentioned above) just completed the installation of our new liner. And, I would highly recommend them. Once we sell the house I’ll let you know if this “investment” served as an attraction or deterrent to would-be buyers.